Cebuana Lhuillier Olongapo Age-Group tennis group-2 championships tightens grip, started series at Subic Int’l Tennis center, Olongapo City Nov. 30 – Dec.4,2017. The ceremonies has been successfully opened. 123 entries of young future star tennis players attended group 2 (UTP) sanctioned of their respective categories. Directed by Mario Inguito Craiz with Renato Selmar, the official tournament referee of Cebuana Lhuillier Olongapo City Age-Group tennis leg with the official ball of Dunlop Philippines. Unified Tennis Philippines(UTP) highest rank future star junior tennisters, has been spotted of the event. The 10-under Jose Ma. 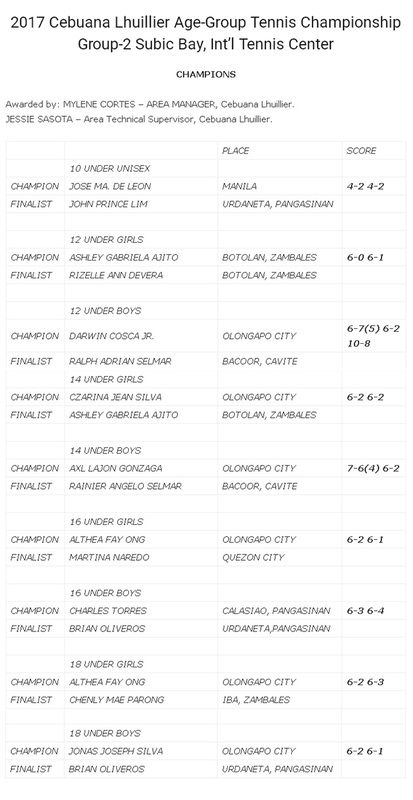 Deleon, U-12 boys Ralph Selmar and U-12 girls Jean Silva, Darwin Cosca and Rainier Selmar of U-14, AXL Gobzaga, Althea Faye Ong, Martina Naredo, Karl Evangelista, Jed Labasno, Jonas Silva for 16 and 18-under boys and girls categories.